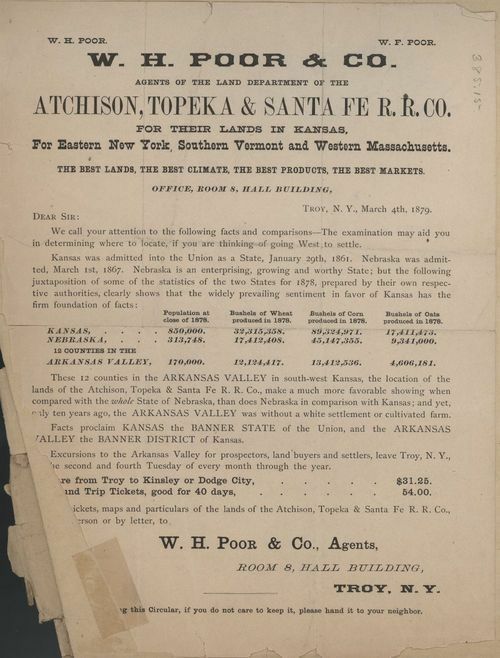 This Santa Fe Railroad circular promots the settlement of the Arkansas River Valley in Kansas as opposed to the whole of Nebraska. Detailed comparisons of population and bushels of grain produced between Kansas and Nebraska are included. Trains depart from Troy, New York, every second and fourth Tuesday of the month via the Atchison, Topeka and Santa Fe Railroad. W. H. Poor and Company, agents of the land department of the Atchison, Topeka & Santa Fe Railroad Co.